Sleeps 10 in 4 bedrooms plus cot. Renovated & refurbished to a very high standard. 100yds to beach, restaurants, shops, bars. No pool and fully enclosed large outside space so ideal for families with small children, Wifi now added. 3 of the best golf courses less than 10 minutes drive (Floresta Parque, Boavista & Palmares). Very comfortably furnished, bright and airy but pleasant in the hot summer months. Equipped to a very high standard, beach towels and hair dryers are provided along with beach accessories. 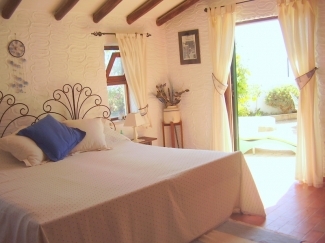 Master bedroom with antique twin beds and private terrace with sea views, En-suite bathroom to Master bedroom with bath with shower over, wc, bidet, basin. King size double with En-suite bathroom containing shower, wc, bidet, basin. 2 Further good sized bedrooms one is a twin and the other has recently been re done with a double and a single with another full size single underneath so sleeping 4 comfortably if required, both these rooms are directly opposite and share the main bathroom, this is a feature of the villa being round in shape with hand painted antique tiles, bath with shower over, wc, bidet, basin. All bedrooms have fully fitted wardrobes & drawers. Lounge has large comfortable corner unit which seats 7 and separate settee which seats 3, TV, DVD, SKY & glazed double doors onto the courtyard. Dining room with large oak table and chairs seating 8 comfortably plus high chair if required. Breakfast bar & stools, full cooker, microwave, fridge/freezer, dishwasher, coffee machine, toaster and wonderful range of cooking utensils, cutlery and crockery for all the family including children. Towels and linen are included which are changed weekly unless by request. Also Beach Towels. Hair dryers in every bedroom. Welcome pack on arrival also included. 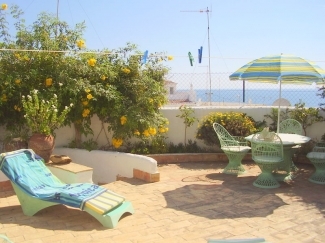 Very spacious pretty courtyard, and top terrace with wonderful sea views, both are suntraps but the courtyard has the benefit of beautiful floral shade if required. 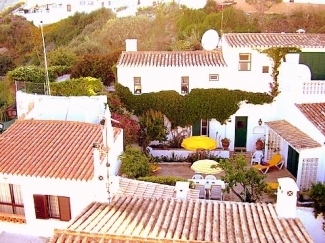 Furnished with tables & chairs and Bar B Q for alfresco dining, and full-length sun beds & cushions. Air conditioning is not necessary as the villa is really comfortable indoors in peak season. Ideal for children as totally enclosed and stair gates are fitted on the outside and inside stairs, plenty of room to play safely outside and in. Every bedroom is heated when required and oil heaters in all living spaces. 100 yards walking distance to the beautiful sandy blue flag beach, very safe with lifeguard in season. Numerous other beaches within 10 minutes drive. Whilst small the village has 24 restaurants and bars catering for every taste and pocket including the famous Beach Bar. However please do contact the owners for discounts especialy for large parties in particular with children as we always try to help if possible.